H. Rick Bamman - hbamman@shawmedia.com Chase Duran of Lake in the Hills takes advantage of warmer weather Monday along Avalon Lane. Duran had been sick for several days and needed some fresh air. Rain is expected Tuesday with a high in the low 60's according to AccuWeather.com. H. Rick Bamman - hbamman@shawmedia.com Todd Colton takes enjoys Monday's mild temperatures as he runs along Miller Road in Lake in the Hills. 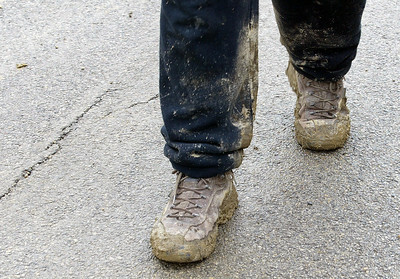 H. Rick Bamman - hbamman@shawmedia.com Carpenter Brian Gordon's boots are caked in mud as he works on a house on Caldwell Drive in the Coventry Lakes subdivision in Lake in the Hills. 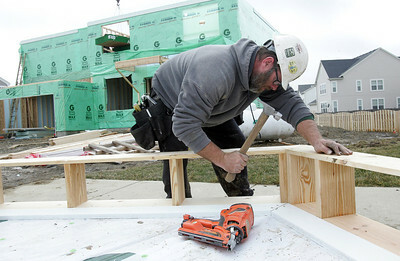 H. Rick Bamman - hbamman@shawmedia.com Carpenter Brian Gordon of Burlington, Wisconsin attaches exterior trim while working on a house Monday on Caldwell Drive in the Coventry Lakes subdivision in Lake in the Hills. Crews were taking advantage of the spring-like weather to work on several new homes. 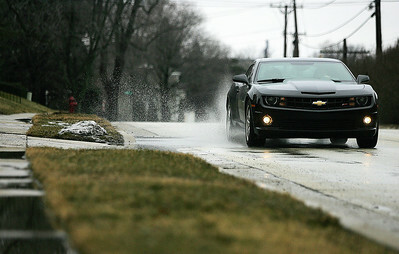 Monica Maschak - mmaschak@shawmedia.com A car drives into a puddle on Lake Avenue in Woodstock on Monday, January 28, 2013. According to AccuWeather.com, temperatures peaked at 48 degrees on Monday, allowing a majority of the snow and ice in the county to melt overnight. 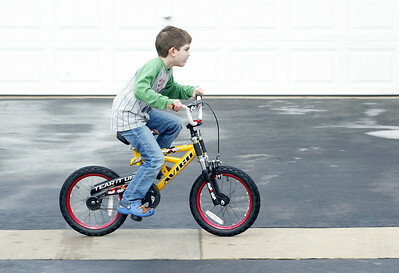 Todd Colton takes enjoys Monday's mild temperatures as he runs along Miller Road in Lake in the Hills.